My father always preached to me about safety. “Don”t drink and boat, wear a PFD, and always wrap your ring dings,” he”d say. Of course, I may or may not have taken those life lessons to mean “always make sure your beer has a coozie so your hands don”t get cold” but that”s not what today”s lesson is about. Today”s lesson has to do more with the latter part of his suggestions. Wrapping it up…with tape! If duct tape is a landlubbers best friend rigging tape is a sailors. Here at APS we offer lots of different kinds of tape but today we”re going to take a close look at PTFE (aka Teflon®, or, as it”s known in the biz, “millionare”s tape”) and UHMWPE (aka Ultra High Molecular-Weight PolyEthylene). More specifically, we”re talking about Dynaglide MT, the Teflon®, and Dynaglide UB, the UHMW. Both are products of DeWAL Industries of Saunderstown, RI. Since 1974, they have been a leader in the manufacture of high performance polymer films and pressure sensitive tapes. Little known outside the belt and hose industry beforehand, in the early 2000″s they got into the sailboat racing market with Dynaglide MT, their Teflon® tape, and the sailing world has been relying on them to help them “put the slip” on their competition ever since. So what”s the difference between the tapes and what are they used for? 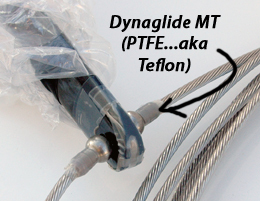 Dynaglide MT is a skived PTFE (Teflon®) film with a silicone adhesive that”s quite aggressive yet easy enough to remove when necessary. While PTFE is generally clear in order to get the adhesive to stick they must score the film which gives the tape a slightly golden color. But the bling color is not what earns it its nickname. The fact that it’s roughly twice the cost of its UHMW brother and quintuple the cost of standard 3M vinyl tape it certainly earns its nickname as “millionaire’s tape”. But, made of 100TFE and at 3.5 mil thick we think it”s pliability is its strong suit and it’s perfect for wrapping around really tight radius bits that need to be ultra slippery or, used in extremely thin areas where you just don”t have much room. For instance, it’s perfect for wrapping Melges 24 spreader end fittings, lining the small space in the hatch slide track, and of course wrapping ring dings where sails might have a chance of getting torn. But given the expense if you’ve got an application where width and pliability isn’t as much of a concern you might want to consider Dynaglide UB. Made from UHMWPE, Dynaglide UB is nearly as slippery as the Teflon® variety, half the price, and 15 times more abrasion resistant than carbon steel. Instead of a silicone adhesive it uses an acrylic adhesive. I’m told it’s traditional to use acrylic on UHMW but that it really boils down to a concern for at what temperature materials breakdown occurs. But, those temperatures are so high it will not be a concern of sailors. Either way, it is plenty aggressive for our needs anyway. While it is available in both white and black we’re told the UV stability/life of the black is expected to be longer. We stock the 6.5 mil thick type in a variety of widths and only in the color black. This is really great stuff for a myriad of applications where abrasion resistance is critical. Common applications include on batten pockets, head foils, under blocks that hit the deck, places where lines run over wood or fiberglass, etc. Essentially, the uses are endless and people that think they need the “millionaire’s tape” certainly ought to consider Dynaglide UB instead. Thanks for getting this UB tape back in stock…I think I may have been the instigator here…I had bought it from you guys some years back, then never saw it here again for a few years, so I contacted the maker, they passed me to an APS sales rep and worked to get it back on your catalog. I use it on my Tornado cat for the spinnaker snuffer hoop where the sail head ring was scraping up the aluminum hoop, making a nasty surface for the sail cloth to tear on. UB stays in place and only needs replacing every few years. Tornado CAN 99 "Full Tilt"